This Ultimate Queenstown Wedding Photography Guide contains a heap of great info and advice to help you plan your Queenstown Wedding Photography. It is written by yours truly, Patrick Fallon of Fallon Photography. I am a full-time Queenstown Wedding Photographer with over 16 years shooting Queenstown Weddings. VENUE FIRST OR PHOTOGRAPHER FIRST? Typically most couples will book their Venue first, then their photographer and other key vendors. This is because, if the venue is super popular it might be booked months or even years in advance. If this is the case, it’s safer to book the venue first and lock in the date and then find a Queenstown Wedding Photographer you like who is available that date. 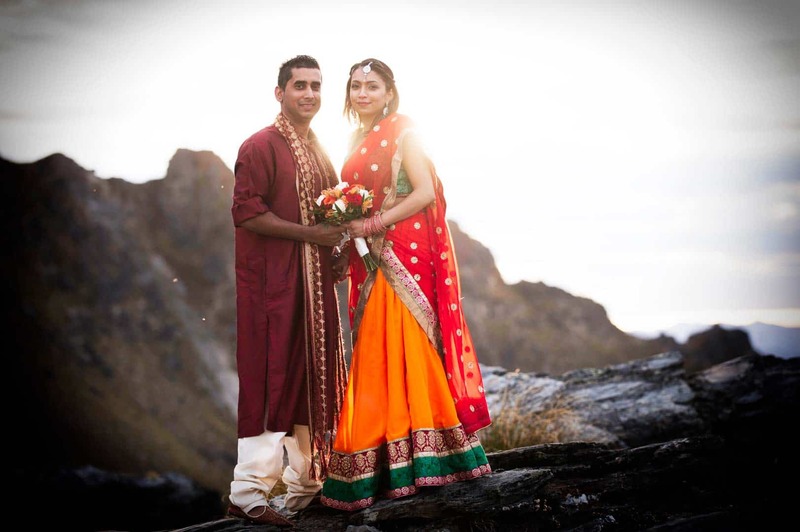 In some instances though, the couple has fallen in love with a particular Queenstown Wedding Photographer. If so, they might have their hearts more set on this Photographer than a given Venue. So it might totally make sense for them to book the Photographer first and then find a Venue available on your chosen date. In this situation you would be juggling the venue and other vendors around the date your favourite Photographer is available. Right, having said all that, let’s talk actual numbers. To keep things simple, if you are planning a Saturday wedding in summer at a super popular venue, you will probably need to book the venue more than a year out. Booking this far in advance, all but the most popular Queenstown Wedding Photographers are likely to have decent availability. On the other hand, if you are planning a mid-week off-season Wedding and you’re choosing a Photographer and Venue that are a little bit off the beaten path, you might be able to book everything as close as 6 months out. Google is your friend (kind of) when it comes to finding your Dream Queenstown Wedding Photographer. I say kind of because there are some fantastic Queenstown Wedding Photographers out there who’s work is amazing and who might be perfect for you. But you may never find them. This is simply because not every Queenstown Wedding Photographer has the budget to hire an SEO pro to help them get their website on the first page of Google. Google past the first 10 pages of search results. (I’m assuming you’re using search terms like “Queenstown Wedding Photographer” or “Queenstown Wedding Photography”). Think of search keywords that are particularly specific and relevant to you. For example add the Venue’s name or a keyword like “vintage” or “elopement” into the mix. Eg search for “Relaxed Queenstown Wedding Photography ” or “Natural Queenstown Wedding Photography ” and see what you come up with. Obviously I am a Queenstown Wedding Photographer (and you can check out my Wedding Portfolio here and my Client Feedback here). However, you can also check my Humongous List Of Queenstown Wedding Venues And Vendors here. This Humongous List is an extensive (Google Sheets) spreadsheet of Queenstown Wedding Photographers as well as other Vendors and Venues. I wrote this under my Wedding Blogger Hat for the Queenstown Wedding Blog, of which I am the author. The Humongous List only includes basic info like company name, website and email address but at least will give you some ideas. P.S. I am a geek and have a penchant for lists and spreadsheets but I highly recommend creating a spreadsheet where you can keep track of all your potential Queenstown Wedding Photographers. If you have a Gmail or Google account you can use Google Sheets for free. HOW MUCH DOES QUEENSTOWN WEDDING PHOTOGRAPHY TYPICALLY COST? This is a tough one. You might as well ask “How long is a piece of string?”. But to my knowledge Queenstown Wedding Photography will typically cost you between $2,500 to $6,500 for one of the top Queenstown Wedding Photographers if you are booking a mid-range package (4 – 6 hours coverage). Different Photographers include different things in their Packages, such as prints, albums, slideshow, mini-websites etc. But typically the cost of the Packages primarily comes down to time. Ie the number of hours of coverage on the wedding day. I don’t currently list my Queenstown Wedding Photography Packages here on the website. However, if you would like a copy of my Packages just drop me a line at patrick@fallon.co.nz and I’ll fire them through to you. Are you planning a Mid-Week Queenstown Wedding? Some Queenstown Wedding Photographers (myself included) have discounted rates. They should also generally have much better availability. This is because the bulk of a Wedding Photographer’s bookings typically fall on a Saturday. The other thing that can help you save money is very low guest numbers. Are you planning a Mid-Week Elopement Style Wedding with 10 or fewer guests? If so, some Photographers (again, myself included) will offer Elopement Photography Packages that are significantly cheaper than their normal Wedding Photography Packages. If you are planning a Queenstown Elopement and would like a copy of my Elopement Photography Packages then please email me at patrick@fallon.co.nz with “Elopement Photography Packages” in the subject line and I’ll fire them through to you. There is no rule that says you can’t let a Photographer know what your budget is and ask them if they can come up with a Package that works for that price. As my dad (who is Irish) always says, “God loves a trier!”. Personally, I have no problem with couples being up front and telling me what their budget is. I can then either help them or not. And if I can’t help them, it’s much easier for me to recommend other suitable photographers if I at least know roughly what their budget is. Firstly, if your Wedding Photographer doesn’t ask you to sign a contract, be very cautious. Not having a contract isn’t necessarily a sign that your Photographer intends to do anything suspicious. But it IS an indicator that your Photographer probably isn’t very experienced. Anybody that has been working as a Full Time Wedding Photographer for any length of time will have learnt that having a good contract is essential. And not just to protect themselves/the Photographer. The contract is also there to protect you, the client. Most importantly, the contract makes your agreement with your Photographer concrete and totally transparent. So trust me, you want a contract. I have been working as a Queenstown Wedding Photographer for 16 years now. In that time, there have been several instances where having a contract was helpful for both me and the couple in question. Weddings cancel more often than you think. I have had multiple Weddings and Elopements cancel over the years, for a variety of reasons. Everything from a death or illness in the family, to family feuds right through to one terrible situation where the bride-to-be passed away unexpectedly before the wedding. Nobody knows what tomorrow holds for them, some things are out of our control. There is a remote possibility some unexpected circumstances might force you to cancel the wedding after you have booked your Wedding Photographer and signed the contract. Or perhaps the wedding isn’t cancelled but you no longer need Queenstown Wedding Photography. This is where the very same Contract you signed can help, by telling you what your rights are with regards to the refund of your deposit. I have had several weddings cancel over the years, some within days of the wedding. Yes, weddings do indeed cancel and for a multitude of reasons. For example, I recently had an Elopement Wedding at a local hotel cancel within days of the Wedding Day. The bride-to-be said that they felt the Elopement felt too rushed and they wished to cancel their Queenstown Wedding Photography. Now, my contract says I don’t have to refund any payments if the couple cancels the wedding. But normally, as long as I haven’t turned down other work, I am happy to refund the deposit. However, in this case I had turned down other paid work (a week long job in fact) due to conflict with this Elopement booking. So, I regretfully informed the couple that I wouldn’t be able refund their payment. But, I offered to honour the original price and agreement for up to a year should they decide to Elope in Queenstown in the next 12 months. I also gave them the option of using the credit for a different type of shoot. They loved this idea and we did a fantastic Couples Shoot that got us some amazing photos. They were happy, I was happy. And having a contract helped both of us understand where we stood and how to move forward in this situation. This agreement between Fallon Photography and (client’s names) & shall not become effective until it is signed and the retainer fee has been paid. At the time the Agreement takes effect, Fallon Photography shall reserve the date and time agreed upon, and not make any other reservations or accept any other clients for said date and time. For this reason, in the event that (client’s names) cancel the Agreement for any reason, all monies paid shall be retained by Fallon Photography in order to offset its loss of business”. Part of the contract’s purpose is to tell both the couple/clients and the photographer when to pay what. I have been incredibly lucky and have only had one incident where a couple didn’t pay me. They did pay me in the end, but it wasn’t until around 6 months after the wedding. To be fair, I think they always intended to pay but ran into financial difficulties. They paid the balance of their Wedding Photography in monthly installments. As a result, it took 6 months for them to pay me the full amount. The other time having a contract is essential is when your Wedding Photographer can’t make your wedding day. For example, if they become injured, very ill or possibly having a baby and can’t make the Wedding Day. Luckily (knock on wood), in 16 years as a Wedding Photographer this has never happened to me. But it IS possible that an emergency could take out your Wedding Photographer. This should be covered by a clause in the Wedding Photographer’s contract. That way, you know in advance what will happen should such a situation arise. Option 1 cancelling the booking. The other option I gave them was for me to find a backup photographer they liked in case I couldn’t make the wedding day. I recommended several different Wedding Photographers for them to check out and approve. (Or not). They chose a few Queenstown Wedding Photographers they liked in order of preference. I contacted those Photographers and all of the Photographers available were super helpful. Not only were they happy to be on Backup, they all offered to do it for the same price I had quoted. (Even though some of them normally charged more). Obviously, there was a possibility some of them could get booked out before the Wedding Day. So by lining up 3 backup Photographers we had made ourselves as safe as we could be. These are all situations where having a contract benefitted both parties. It made it easier to understand the terms of our agreement and what to do in certain tricky situations. Note that in none of these cases was legal action required. So you could argue that the contract wasn’t necessary in any of these situations. However, I would argue that having a contract in the first place meant that both parties understood the situation. This made misunderstanding and escalation of the situation far less likely. Which made it much much easier to come up with a solution that satisfied both parties. The amount you need to pay as a deposit may vary from Photographer to Photographer. I ask for 25% of the deposit to confirm any bookings. If I have a couple who wants to book me but haven’t paid the deposit, I pencil their date. If I then get somebody else wishing to book me for that date I will let them know and give them first option. However, if they don’t pay the deposit, they may lose out on that date. When the final balance is due will vary from Photographer to Photographer. I ask my . couples to pay the balance in full 15 days before the date of the Wedding. I know this may seem unfair, asking you to pay in full when you haven’t even seen your photos yet. But, contract or no contract you actually have a lot more power than your Wedding Photographer. I’ll explain this below. Wedding Photographers rely on good feedback from their couples to get more bookings. Reviews on Facebook and Google have a huge impact on a Wedding Photographer’s business. And bad reviews have even more impact than good ones! Which means that, contract or no, you have a lot more power in many respects than your Wedding Photographer. So if you are dealing with an experienced and relatively well-known Queenstown Wedding Photographer don’t be nervous. All it takes is one bad review to put a huge dent in your Wedding Photographer’s business. This is why I always bend over backwards to keep my couples happy no matter what my contract says. My contract gives me the rights to use any photos from a wedding to market my business. (Eg put them on my website or share them on Social Media). Several times over the years I have had couples request that I not share any images online even after they have signed the contract. What did I do in this situation? Do I use their images anyway because they have signed the contract? No. Because it’s just not worth it for even one bad review. And that is why I say that you, the couple, have a lot of power in this situation. I hope you found this Blog Post helpful. If you have any comments or questions, you can leave a comment here at the bottom of this post or get in touch via my Contact Page. This Blog Post was written by yours truly – Patrick Fallon, Queenstown Wedding Photographer & Author of The Queenstown Wedding Blog.